October saw a return to the ADNOC training facilities in Abu Dhabi for another “Training to Inspect to JIG Standards” course. Once again our hosts, ADNOC and, in particular Mr Al Ansari (Vice President-Aviation Operations Division) and Stratos Vasilas (Senior Quality Assurance) arranged the location support and the hospitality to ensure another great course. 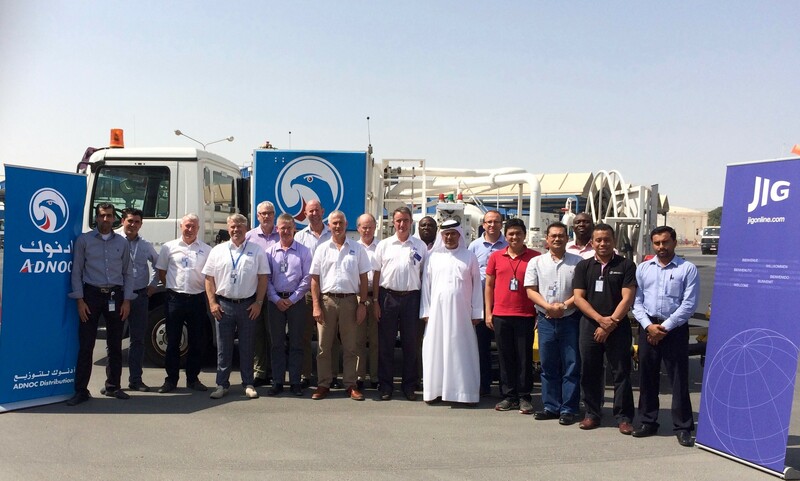 Many thanks to ADNOC and their staff for ensuring that the practical work, which is a vital part of the training, went safely, and enabled all involved in the course to observe the JIG Trainers (in the 38 degree heat) demonstrate the high level of expectation in an Inspection to JIG Standards. The maximum 12 attendees from as far as Australia and New Zealand, as well as Indonesia, Malaysia and Nigeria, took part in the intensive 5 day course, which culminates in an exam that even some of the industry’s most experienced inspectors find challenging. Thankfully, Andy Chubb of Air BP, previous JIG Council Chairman, confirmed his inspecting credentials! The successful candidates now join an exclusive club, which, along with the rest of the heritage JIG Inspecting community, sets the highest standard for the industry. The Trainers for this course, Chris Jones, Anthony Kitson-Smith and Tony Rowe were noted in the feedback for their knowledge and professionalism in delivering the course, particularly when the sessions like product receipts, pressure control and aircraft refuelling were conducted in very hot conditions. I think that we have at least 100 years of experience in that group (collectively, not individually!). We continue to learn from the feedback and we will incorporate some new ideas in future Training. Our next course is in Panama City in November and, once again we are grateful to another one of our most supportive JIG members, ASIG/BBA for helping us develop the course and set up the location for our training needs. Chris Jones and Richmond Hannah will be our Trainers. The success of the JIG training has surpassed our expectations and we believe it is now a vital part of our vision to develop the JIG Standard and educate the industry globally to ensure compliance to that JIG Standard. We will be communicating the 2016 courses soon and I would encourage anyone interested to respond early as we are always oversubscribed.